NEW SMYRNA BEACH, Fla. (February 11, 2018) – Twenty-year-old Cole Anderson scored his first win of the 2018 World Series of Asphalt Stock Car Racing on Saturday night at New Smyrna (Fla.) Speedway while racing the No. 97 TimberwolfPlastics.com Toyota Camry. Racing with ATF & Gunslinger, the Minnesota native has been working closely with NASCAR Camping World Truck Series champion Mike Skinner to accelerate his learning curve, while gaining track time and honing his skills at the annual racing series that attracts up-and-coming talent from across the country. 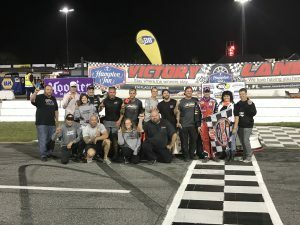 Marking Cole’s fifth career win at New Smyrna Speedway in pro late model and super late model competition, including his second in a Pro Late Model Speedweeks’ event, Anderson took Saturday night’s win in dominant fashion. After qualifying on the pole, the field was inverted resulting in an eighth-place starting position for Anderson in the 35-lap feature. Falling as low at the 10th position in a caution filled race, Anderson had to avoid the on-track melee while climbing his way back up the leaderboard. Taking the lead on lap 14, Anderson remained in the point position until the checkered flag waved. In 2018, Anderson will be behind the wheel of the No. 97 Toyota Camry in pro late model and super late model competition across the southeast. For more information about Cole Anderson, visit ColeAndersonRacing.com.